On Monday September 10th in French channel MCM there will be a show called "L'INTEGRALE DEPECHE MODE" at 8:30pm , so be ready ! On Friday June 15 th: DM day on MTV! 21:00 - 21:30 (9:00 pm to 9:30pm) Making The Video "I Feel Loved"
On French TV On the show called CD'Aujourdhui on May 16th before each Flash news in morning , at noon and at night there will be a DM interview. On French TV channel MCM on Monday at 11:00 pm will be a special show about DM . On May 7th at 3:00 pm Uk time, BBC London Live celebrate Depeche Mode's 10th studio album release with a 2 hour special, hosted by Gary Crowley. With a history spanning over 20 years, the programme brings together for the first time fresh interview footage from all of the past and present band members, as well as journalists, DJ's from across the water and those integral to the band's success. Hear how Mute Records supremo Daniel Miller first decided Depeche Mode were key talent and instigated an infamous 'handshake deal' with the teenagers that has remained concrete for over 2 decades. Vince Clarke candidly admits the reasons behind why he left the band just as they started making it big whilst Andy Fletcher admits the band were not worried by the departure of their main songwriter. Alan Wilder reveals how he eventually became Vince's replacement and details the rocky but enjoyable journey he took with the band until his decision to follow in Vince's footsteps and walk away from Depeche Mode in 1995. Get the inside information on the troubles with Dave Gahan during the 90's with his drug addiction, and hear first hand how Anton Corbijn, the band's visual director, heard from REM frontman Michael Stipe that Gahan was in turmoil. The documentary concludes with all 3 remaining band members reflecting on their careers, and the ups and down of their time with Depeche Mode - from playing in front of 70,000 fans at the Rose Bowl, Pasadena, to how the band came through their personal problems and the tension to relaunch themselves and produce their new album, Exciter. In documenting the band's rise from Basildon minnows to stadium-filling giants, Gary Crowley finds out what makes the band, and what moves the band. Hear the story of how an electronic 4-piece group conquered the world, against all odds, to become one of this country's finest and most important products. 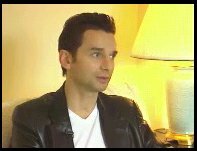 In the french TV Show PLUS VITE QUE LA MUSIQUE on TV Channel M6 on Saturday April 27th 2001 at 8:00 pm there will be an interview of Depeche Mode in that show. Info by Bart aka Wime on the french Mailing list "Depeche"
"Spécial Depeche Mode : Depeche Mode est en train de revenir sur le devant de la scène, avec la sortie d'un très attendu nouvel album "Exciter", qui sortira en mai prochain. Rencontre avec Le groupe qui a bouleversé les années 80 et 90. 52 min. " On French Radio OUI FM between May 21 and 25 th, a small story and bio of DM at 18h30 of 10 minutes plus a song. 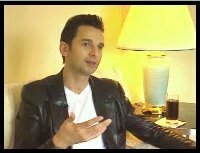 DU 24/04 AU 30/04 SPOTS de 20"
On RTL radio station on April 28th 2001 between Midnight and 2h00 am Georges Lang will make a Saga DM ( s story and bio of DM) and will present the new album and there will be a 30 minutes interview he had with Depeche Mode while they were in Paris for their promotion. hope your VCR will be ready! "Depeche Mode a été un des groupes-phare des années 80. Après une dizaine d'albums, des concerts à travers le monde, depeche Mode est de retour avec "Exciter", album à venir. "